Now prior to this Goldfish goodness, I was already planning what I was going to write about today on the ride home from work. My new gig offers yoga at lunch on Mondays and Wednesday. The focus this week for each day was Acceptance and Giving. And let me tell you this yoga teacher is great. I really truly felt like I had a grasp on things finally after Monday’s practice. As you can tell after last post, I was a little bitter. But I do feel better. I feel like I opened up and accepted that this is my new routine, my life for the next 9 months, and there is nothing I can do but accept and enjoy the ride. Along the way, sometimes I will have to give. Give thanks, give in, give back. I hope this blog is part of my way as giving back. To let everyone know that I am normal. Your average joe with a big dream. I hope I give thanks daily. Thanks for my family and friends for support. Thanks for my health and body strength. Thanks for food and friendships. Also, I may give in. Throw the flag. And with that, I am accepting that…. maybe tomorrow is not gonna be the best day to get a workout in. Or maybe my body needs rest and I must surrender to a glass of wine and bed. All this realization has made me very calm this week. Very content with things this week. If you haven’t done yoga, I really recommend it. I cried today. Its been a while since I have cried. Not for anything, but yoga does that. You really leave it on the mat. Let go of the day, and be in the moment. I challenge anyone who is actually reading this to take a yoga class at least 1-2 times a week. Anyways, I am off to bed! Happy hump day! 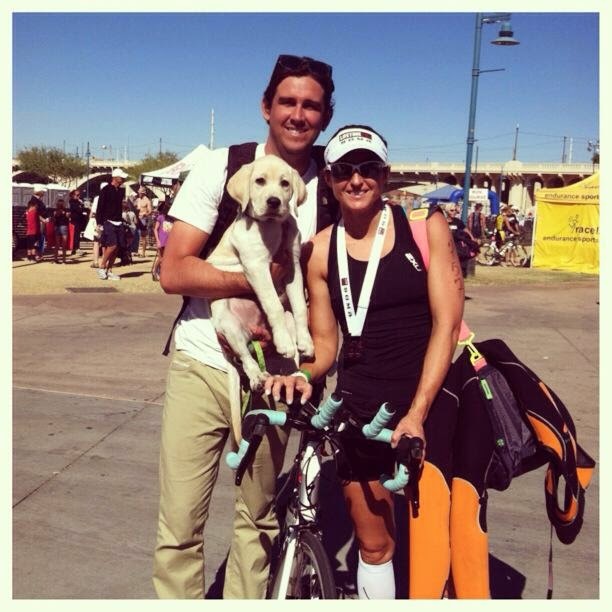 When I signed up for IronMan, I was working for myself, freelancing, doing my thing on my time. My husband Josh and I agreed that my long training days would be on Fridays. This was to ensure that we still had “family” time on the weekends. Well, I got offered a job on Christmas Eve and I took it. I started two weeks ago. HOLY $h**! Things are crazy. I had a melt down already and I am not even NEAR my big race. I get up at 4:30am or 4:45 (usually), I get my workout in, I shower and eat SUPER FAST, then head to work. I then sit in traffic and come home, and some nights I teach a bootcamp or spin class. I feel like I have zero time and I go to bed at 8pm almost every night. I have no time for laundry, shopping, family. Its so hard. I feel like the house isn’t so clean anymore. I don’t even get the mail every day just because its a hassle and low priority. The end of week 2 was a little bit better. Thankfully Josh understands… for the most part.. but I don’t know how normal people do this training. It is seriously out of control. I need to just train full time. Luckily it hasn’t beaten me up too bad… but I just mean… man.. I had a rough 2 weeks. Looking for some motivation and inspiration in the weeks to come. I know I will figure this out. And it all works out. Just praying for that to happen sooner than later. Going to bed.. LOL GOOD NIGHT! Happy 2015… the year of ‘GO BIG OR GO HOME’! Today is January 1st. Happy New Year! Today is day one of prepping my body for IM. A little strength and conditioning today did the body good!